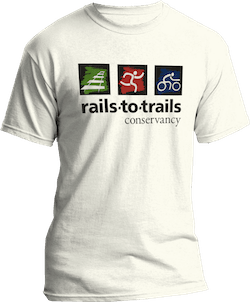 Donate now to support Rails-to-Trails Conservancy’s work to build, maintain, defend and connect trail corridors across the nation. PLUS get a FREE RTC T-shirt with your support of $18 or more! Become a monthly donor and get a T-shirt, plus our annual calendar. Your gift entitles you to an RTC Member T-shirt! -- Please Make a Selection -- Small Medium Large X-Large No Thanks! No Thanks! I want more of my contribution to go to trails! Give at least $18 and receive an exclusive RTC T-shirt! Copyright © 2001-2017 Rails-to-Trails Conservancy (RTC). All rights reserved. 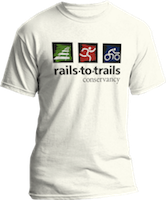 Rails-to-Trails Conservancy is a nonprofit, charitable organization. Membership contributions and donations to RTC are tax deductible. Visit our tax deduction page for additional details. IRS Form 990, financial registrations, and independent financial audit. You can also donate by downloading our membership form or by calling 866.202.9788.